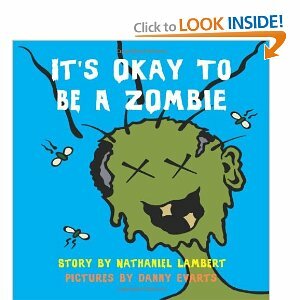 The book “It’s Okay to be a Zombie: An Unchildren’s Book” has spawned clothing, buttons and water bottles. The book was written by Nathaniel Lambert and illustrated by NEHW member Danny Evarts. The items created with Evarts’ artwork can be purchased at the Café Press website, www.cafepress.com/UnchildrensZone. The book can be purchased through Amazon (www.amazon.com/Its-Okay-Zombie-Unchildrens-Book/dp/0982727526/ref=sr_1_1?ie=UTF8&s=books&qid=1288934661&sr=8-1). Evarts is selling clothing with his unique artwork through Café Press (www.cafepress.com/DannyEvarts). According to the Café Press website, it offers the best selection of personalized gifts and unique t-shirts, clothing, mugs, art and posters. They have millions of designs from shopkeepers around the world that range from funny to cool to promotional.